Really easy recipe. 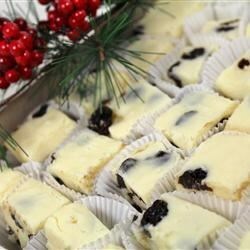 White chocolate, dried cherries, and a few ingredients mix together to make this delicious fudge. Grease an 8×8-inch square baking dish. Melt chocolate chips, condensed milk, and butter in a saucepan over medium-low heat, stirring often, about 5 minutes. Remove from heat and stir in cherries and almond extract. Pour fudge into prepared baking dish and spread into a smooth layer. Cover and refrigerate until firm, 1 to 2 hours. Cut fudge into 64 1-inch square pieces.